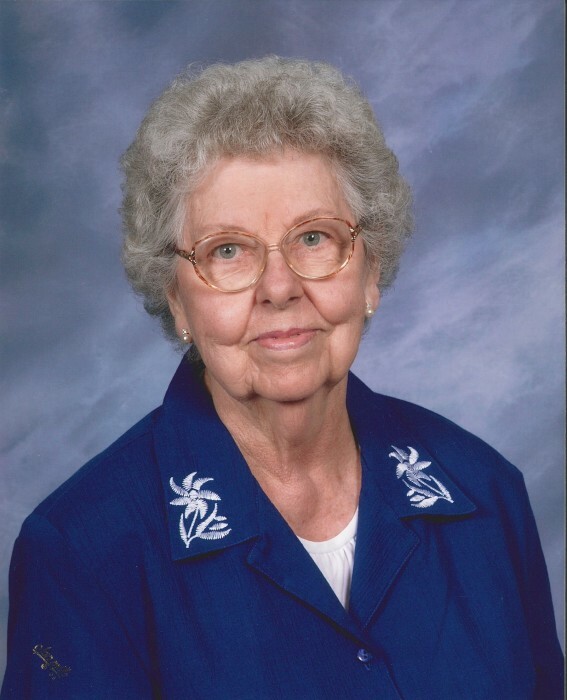 Mildred Bagby Edwards passed from this life Monday, February 11, 2019, at the King’s Daughters Home in Mexico, Missouri. Mildred entered this life December 3, 1923 in Huntsville, Missouri. She was the second oldest of seven children born to Sterling and Beatrice (Malone) Bagby. In January, 1946, Mildred went to a dance at the Friendly Inn in Huntsville, Missouri. At the dance, a young man named Hubert Kenneth Edwards (just recently home from the war) asked her to dance. Eight months later, August 15, Kenneth and Mildred were married in Huntsville. They had three children: Carolyn Beatrice, Virginia Ann, and Randall Kent. Mildred grew up in rural Randolph County. After her mother died (when Mildred was eleven years old), the family moved to Huntsville, Missouri. She graduated from Huntsville High School and Moberly Junior College (being the class salutatorian). After Mildred and Kenneth married, they settled in Moberly. While Kenneth made their living by working as an engineer on the Wabash Railroad, Mildred set about raising their family. Mildred was the ultimate wife and mother. Her entire world and activities revolved around her husband, children and her church. She was a Sunday School teacher, Camp Fire Girls Leader, a Cub Scout Leader, member of the Eastern Star, and was involved in all the activities of her children. Mildred’s faith was very important to her. She was a life time member of the Disciples of Christ Christian Church, and when she died, she was the oldest member of the Central Christian Church in Moberly, Missouri. Music was a huge part in the life of Mildred’s family. Every Christmas Eve, everyone would gather around the piano to sing Christmas carols while Mildred would play. In her later years, she and Kenneth were members of a senior citizens band that performed at nursing homes in the area. Every summer Kenneth and Mildred would attend Blue Grass Festivals on the weekends. Words that would describe Mildred: devout Christian, devoted wife and mother, musician, seamstress, fabulous cook, caring, warm-hearted, dependable, steadfast and a good friend. Preceding Mildred in death: her husband of 49 years, Hubert Kenneth Edwards; her parents, Sterling and Beatrice Bagby; her mother and father-in-law, Hubert and Lillian Edwards; three brothers, Jesse Edward Bagby, Sterling Bagby, John Mitchell Bagby; an infant sister, Irene Bagby; four brothers-in-law, Thomas Reubin Edwards, William Delbert Edwards, Floyd Walker, Clyde Heater; five sisters-in-law, Jessie Mae Heater, Dorothy Bagby, Pauline Bagby, Marie Bagby, Irene Bagby; a granddaughter, Nicole (Green) Simmons Zitting. Surviving family: Carolyn Green and Rich, Ginny White and Steve, Randy Edwards and Lisa; six grandchildren, Scott Green, Beau White and Christy, Kelli Moulder and Scott, Drew Edwards, Alex Edwards and Raffaella and Justine Edwards; a grandson-in-law, James Zitting, six great grandchildren, Malone Simmons, Grady White, Colin White, Silas Moulder, Beckett Moulder, Corbin Moulder; four step- grandchildren; Alvin Zitting, Ethan Zitting, Diana Zitting and Austin Zitting; a brother, Tyson Bagby; one sister, GAnna Walker; two sisters-in-law, Bette Edwards, Maurine Edwards. Memorial contributions to the Central Christian Church or to the King’s Daughters Home would be appreciated. Services honoring and celebrating Mildred’s life were held at the Cater Funeral Home Chapel. Committal prayers and burial followed in the Oakland Cemetery.